I made these a while ago and it has been languishing in my drafts folder for too long. I had some pretty red & yellow bell peppers and played around with the stuffing a bit and used Boca Meatless Ground Burger to make this more hearty and filling. The crispy bread crumbs balanced the filling really well & it made for an enjoyable meal. 1) Heat 1 tbsp olive oil and add in the garlic and onions with the red pepper flakes.. Cook till they soften. Next, add the chopped carrots and stir with a pinch of salt. 2) Once carrots are tender, add in the chopped spinach, boca crumbles and cook this mixture till it comes through. Season with salt & pepper to taste. 3) In the remaining 1 tbsp of oil, saute the bread crumbs till pale golden & crisp. Stir in the cheese and season with salt & pepper as desired. 4) Reserve about half cup of the bread crumbs and mix the remaining 1 cup with the veggie mixture. 5) Preheat oven to 375F. 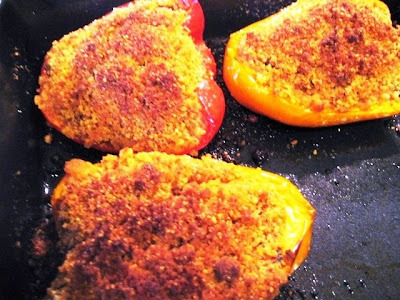 Spoon the veggie mixture into the pepper halves and top with the reserved bread crumbs. Place the peppers in a pan coated with oil and drizzle the tops with more olive oil. 6) Bake for about 45 minutes or until the tops are browned and peppers are tender. Serve warm. Beautiful colour and love the crunch on the top. yummy! 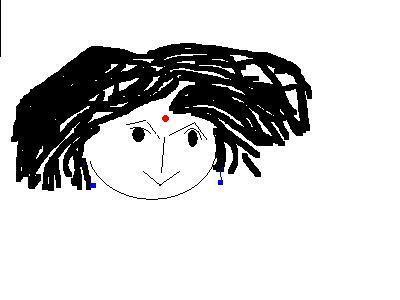 cant resist it lavi...I am doing this asap! ooh, looks so delicious! Beautiful pictures. 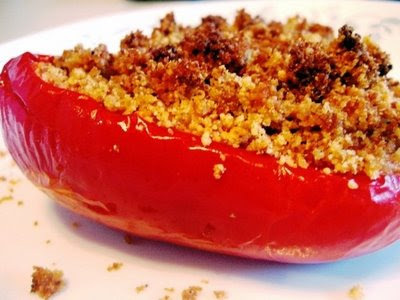 Love stuffed peppers.......good recipe and click. What a great idea to use the burgers and spinach. Gotta try this. You got the best red peppers! Colors are just wonderful. This is a cool recipe and sounds delicious! Adding crumled boca burger is a cool idea! nice idea to use ground burger.. should taste just awesome.... looks very nice laavanya. So pretty! I loooove stuffed peppers. Ive never tried boca, for some reason I always buy morningstar products. Wonder if there is a big difference? Very differnt idea. my husband lloves anything stuffed in bell pepper. So I might give this a try. wow this looks so colorful and delicious! looks so good. I have to try out sometime. Anon, I've added a widget so you can subscribe via a reader. Looks wonderful,love the stuffing you have used for this..seems very filling. I love recipes using boca burger, this is a great recipe!